Digitization funded by NEH digital to microfilm conversion project. 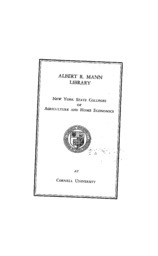 Title selected from the series Literature of the agricultural sciences for the Core historical literature of agriculture, Crop protection and improvement. The titles are also part of the series: Literature of the agricultural sciences.